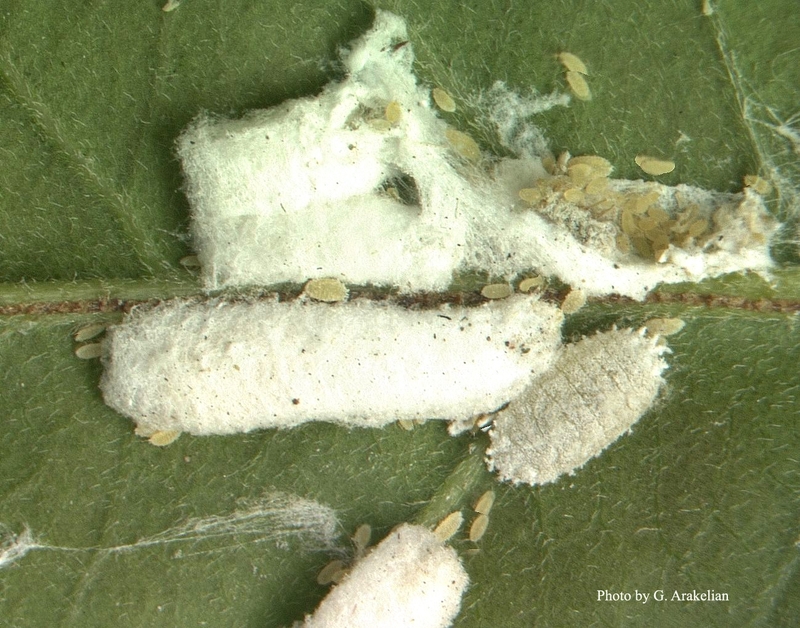 Bougainvillea mealybug, Phenacoccus peruvianus was recently found in Los Angeles County. Dr. Gevork Arakelian, Senior Biologist, Los Angeles County Department of Agricultural Commissioner/Weights and Measures prepared this report. Distribution: Native to South America (Argentina, Peru).Introduced into Great Britain and Mediterranean coast of Europe. 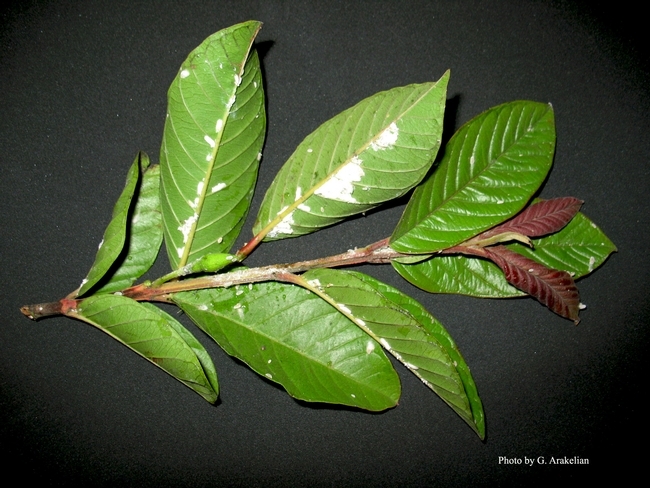 In the U.S.: infested plants were found in the nursery trade in southern California (under eradication). Hosts and damage: Polyphagous. Recorded on Alternanthera sp., Araujia sericifera, Aucuba japonica, Baccharis sp., Bougainvillea, Buddleja sp., Cestrum sp., Chili peppers, Dicliptera suberecta, Dodonea viscosa, Eupatorium sp., Guava, Myoporum laetum, Solanum vespertilio, Solenostemon blumei, Tobacco, Tomato,and others. Field Identification: Adult females (about 3 mm) are elongate oval, grayish-white and lack marginal wax filaments. 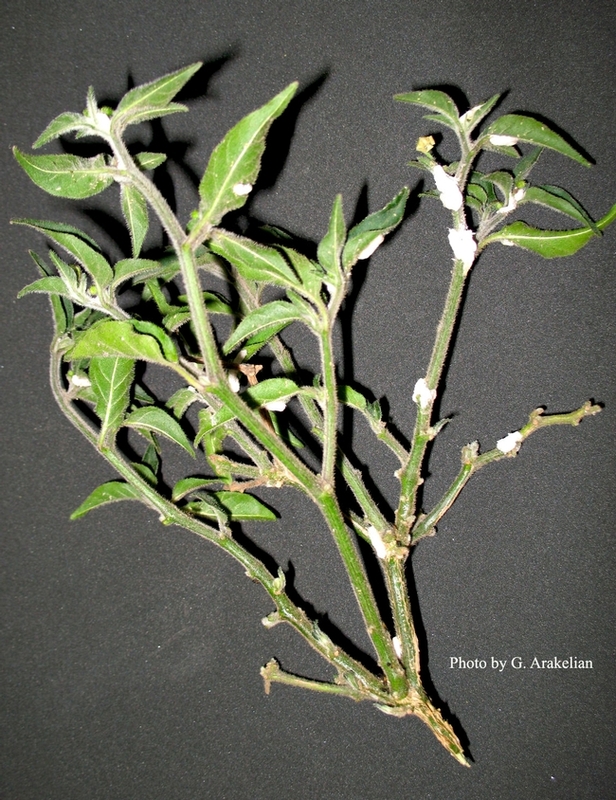 They produce relatively long, white waxy ovisacs on the leaves and stems of their host plants.